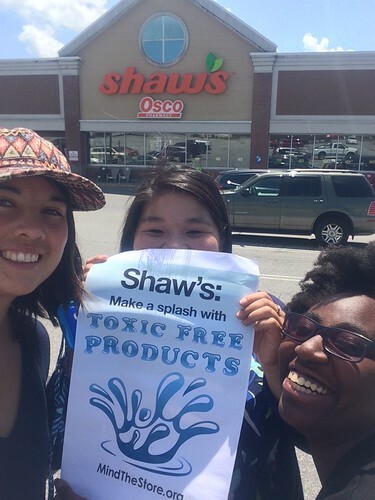 Last week consumers across the country came together to call on Albertsons and its subsidiaries, such as Safeway, Acme, Jewel-Osco and Shaw’s, to go toxic-free. From Anchorage, AK to Greenburgh, NY to Albertsons’ hometown of Boise, ID, shoppers urged the company to turn up the heat on toxic chemicals this summer. Consumers visited stores in: Alaska, California, Colorado, Idaho, Iowa, Illinois, Maine, Massachusetts, New Jersey, New York, Oregon, Texas and Washington, DC. Many held signs outside of stores, distributed leaflets to customers, spoke to their store managers about their concerns and spread the word on social media. Dozens of customers called the Albertsons customer service line encouraging the company to take action on chemicals in products. Over 2,500 Story of Stuff supporters signed a petition to the company, adding to the 130,000 consumers who’ve signed petitions since 2016. We released new research uncovering that Albertsons sells products containing toxic chemicals like lead, formaldehyde and parabens. We even found chemicals of concern in store brand products, such as sensitive skin body wash and kids’ bubble bath, sold by Albertsons. More store visits are planned for this week in Maryland, Vermont and Washington. Albertsons is the second largest grocery chain in the US with subsidiaries like Safeway, Jewel-Osco, Acme, Shaw’s and Randalls and a total of 2,200 stores across the country. As one of the nation’s largest retailers, Albertsons has a responsibility to keep toxic chemicals off its shelves! Other big retailers like Walmart, Target and CVS, are making meaningful progress in tackling toxic chemicals in products. But in the first-ever report card grading the largest retailers on toxic chemicals, released last November, Albertsons earned a grade of F with just 12.5 out of 130 possible points. The company has no public safer chemicals policy in place and has yet to give any public indication that it’s developing one. Last November advocates delivered 125,000 petition signatures to the company’s headquarters in Boise. Petition signers called on Albertsons to remove toxic BPA from its canned food liners and develop a comprehensive safer chemicals policy. This followed a report in 2016 that found BPA in the lining of 50% of Albertsons store brand cans tested. More recently, this May we co-released a report that found BPA in the liners of 36% of Albertsons store brand food cans that were tested. That demonstrates progress since last year but clearly more work is still needed. Will Albertsons Mind the Store? It’s our hope that Albertson will stop treading water and start making progress this summer and fall as we update the grades in the second annual retailer report card. We hope to see Albertsons develop a best-in-class safer chemicals policy and program to meet the rising consumer demand for safe and healthy products. Beth Kemler is the Mobilization Director for Safer Chemicals, Healthy Families. Cindy Luppi is a spokesperson for Safer States.